! !VRy10:Sv7*100:y9; set y10 to v7, multiply by 100 then divide by y9. Am I on the right way at least? a/b = c/d is equivalent to a*d = b*c.
Edited by Salamandre at 20:24, 16 Dec 2014. Edited by AlexSpl at 20:31, 16 Dec 2014. Edited by Salamandre at 20:33, 16 Dec 2014. R4 = 41 tells you only that Deviation = 0. First, you should find the basic splitting. 1. Find both Army_Power and Neutrals_Power. They are just the sum of AI values of all creatures in the corresponding armies. A powerful hero at your side doesn't change anything. 2. Find k = Army_Power / Neutrals_Power. Here all the floating point numbers are of double precision, or type; sizeof(double) = 8 bytes. 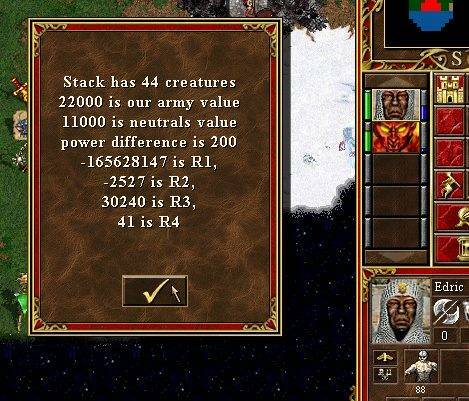 if R4 >= 80 increase the number of stacks by 1 unless you have already 7. Awesome, now we know everything. Edited by Salamandre at 20:41, 16 Dec 2014. The basic splitting is 4 because of 200% power difference, according to document. Maybe he missed >=200, because I get 3 stacks. Edited by kicferk at 20:42, 16 Dec 2014. Try with 89, I hope you get 2 stacks. Edited by AlexSpl at 20:42, 16 Dec 2014. The basic splitting is 3 because of 200% power difference. According to my table, the basic splitting is 2 when k >= 200%. How many stacks do you see? Edited by Salamandre at 20:43, 16 Dec 2014. 2, edited. What is the accurate table, please give me so I can add the calculations. ok got it. Now going to write the thing. Edited by Salamandre at 20:59, 16 Dec 2014.
;right click on any monster to see its split. Edited by AlexSpl at 21:13, 16 Dec 2014. 1. You have 7 stacks according to the table, still you have to add 1 stack due to Deviation, just don't. Edited by Salamandre at 21:22, 16 Dec 2014. Yeah I forgot, will add those checks for final, thanks. The first case needs only one fix, but the second is a bit longer to do. Why, just compare the number of neutrals with the number of stacks. If less, #stacks = #neutrals. Edited by Salamandre at 21:46, 16 Dec 2014. Sorry just being lazy, it was longer because I have to type a line instead of one character, both fixed. ok, here is a draft of how it will look when right-click on monsters. it shows the number of stacks, it shows if there is upgraded stack, green number is total number of monsters, right number (1-10) is about monster stack's aggression (1/compliant, 10/savage). I have no idea what other infos to add, anyway, both # infos are disabled by default, must configure ini file to show them because I consider cheat. It seems you have misplaced Grand Elves. They should be in the middle - [N/2], where N - number of stacks.